Preheat oven to 240°C (475°F). 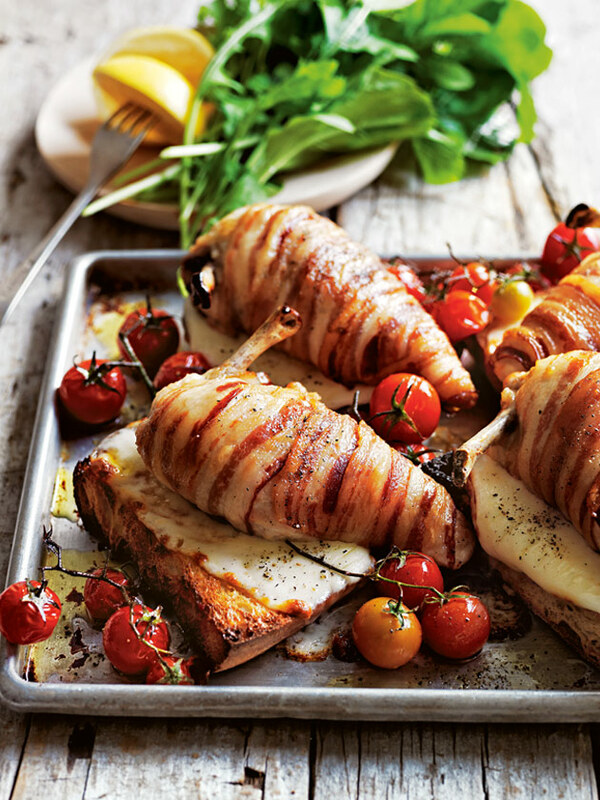 Wrap each of the chicken breasts in 3 pieces of the pancetta. Place the bread on a lightly greased large oven tray and top with the chicken parcels. Drizzle with the oil, sprinkle with salt and pepper and cook for 15 minutes. Remove from the oven, set aside the chicken, turn the bread over and top with the cheese. Return the chicken to the pan, placing on top of the toasts. Add the tomatoes and cook for 5 minutes or until the pancetta is golden and crisp. Serve. Serves 4. + Stracchino is a soft, mild-flavoured cow’s milk cheese from delicatessens. Try this: Serve with rocket leaves and wedges of lemon.